Part of the show Can you Flavour Breast Milk? Secure the helium balloon to something solid in the car. Make sure it can't get in the way of the driver. Hold the almost full bottle of water on its side pointing along the car. Watch what happens to the balloon and the bubble as the car accelerates and brakes. You should find that as the car accelerates, the balloon and the bubble move forward. As it brakes they both move backwards - in the opposite direction to everything else in the car. 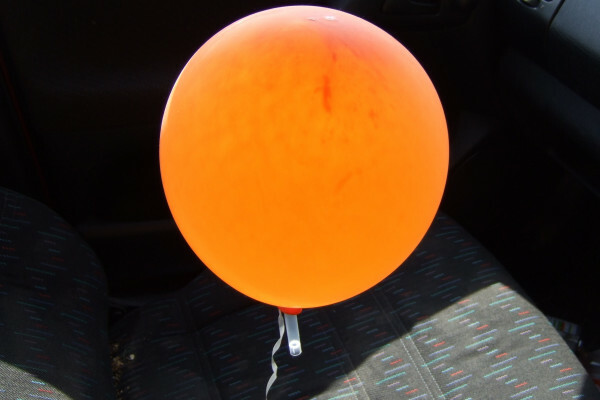 An orange helium balloon and a white air balloon in a car which accelerates and then stops. You should see them moving in opposite directions. Objects will continue at the same speed unless you apply a force to them (Newton's first law of motion). If you brake a car, all the objects within it will try to continue at the same speed and move forwards relative to the car. This is why if you don't wear a seat belt you will continue forwards until you meet the windscreen at high speed. The interesting bit comes when you consider an object that is lighter than the fluid surrounding it, such as the bubble in the bottle. Now when you brake the car both the water and the bubble attempt to continue forward, but because the water is denser than the air it will push the air backwards to allow the water to move forward. The bottle, water and bubble are moving with the car. When you brake you apply a force to the bottle and its contents continue moving forwards. The water is denser than the air so it pushes the air backwards as the water moves forward. The helium balloon works on the same principle, because the helium balloon is less dense than air it is pushed backwards by the air rushing forward. If you brake everything will tend to rush forward, but air is denser than the balloon. So the air pushes the balloon backwards. If you accelerate then the opposite happens and the balloon moves forward.